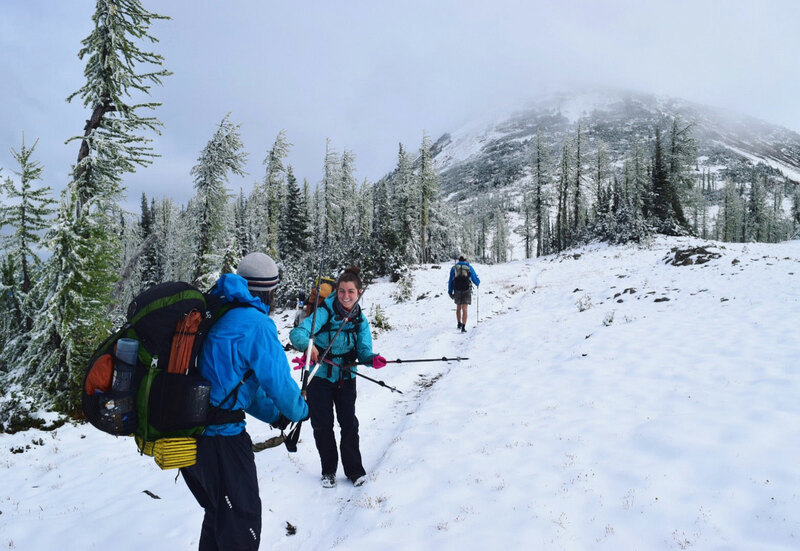 The Pacific Crest Trail is a world-class place to ski, snowshoe, mountaineer and enjoy snowy solitude and beauty. During the fall, winter and spring, you truly have endless opportunities for winter recreation. There are hundreds of access points – more than a lifetime of exploration awaits. Enjoying a beautiful day of skiing on the Pacific Crest Trail in the Sierra Nevada. Typically, the mountains are covered in snow from October through June. Snow that’s deep enough for good skiing and snowshoeing might not come until November or December. How much snow will be found in the mountains varies widely from year to year. A steep line on the PCT in California. It’s important to be prepared. Proper research, planning, and training can go a long way towards helping you be safe, manage and enjoy the snow on the PCT. Introduce yourself to snow travel slowly and cautiously on easy day trips before you attempt overnighters. Hikers and riders may encounter snow in the early-season, especially in the shade and north side of passes. Most hikers and horseback riders wait for the snow to melt. The snow-free season is short in the mountains of the West – it typically gets going in early July and lasts through September. We see it every year – it’s May or June, it’s sunny, and you’re excited to go backpacking in the mountains. The reality is that that’s generally too early for normal backpacking conditions in the mountains of the Western United States. Most years, you won’t find snow-free trails at high elevations until sometime in July. Delay your trip or be prepared for difficult travel. The chute on Forester Pass is just one of many steep slopes on the trail. Photo by Karen Wang. Snow and the attendant flooding snow-melt can easily ruin your trip. Either avoid these problems by waiting for the snow to melt, or prepare with proper training, physical fitness, knowledge, and attitude. Snow changes the nature of your trip. It shifts the Pacific Crest Trail from a normal summer backpacking trip to something closer to mountaineering. There are few absolute truisms on the trail. Other’s prior experience should be used merely to inform. Just because someone else did it, doesn’t mean that you’ll be ok. 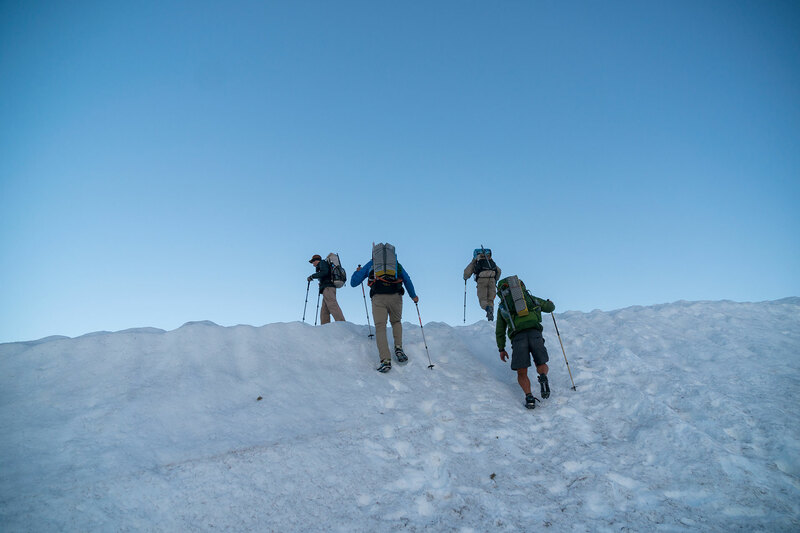 Crossing some snow is practically a given during the course of a thru-hike or thru-ride. 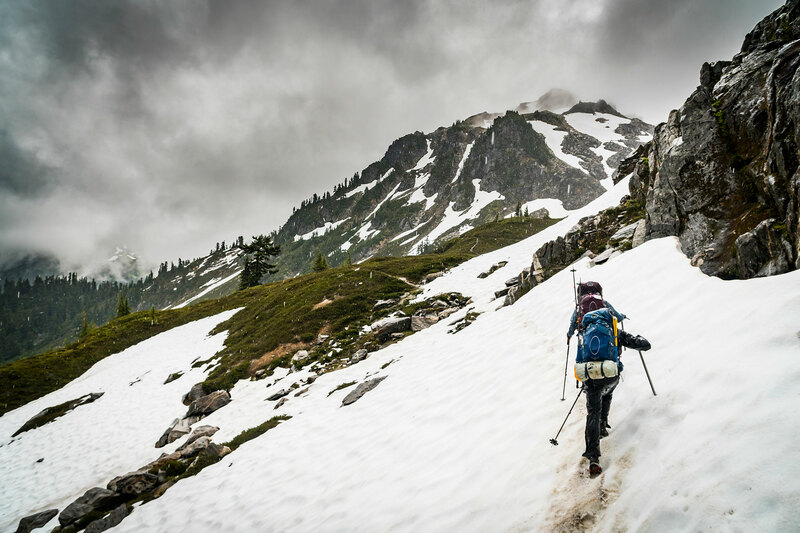 Cold temperatures, freezing rain, and early winter snowfall compete with many hikers’ desire to complete the Pacific Crest Trail in one season. We’ve seen the results when “summit fever” outweighs rational thought. Your decisions may not only put you at risk of serious injury or death, they can put the lives of rescuers in peril as well. Prepare and you’ll be safer, less anxious and have more fun. Build personal experience. 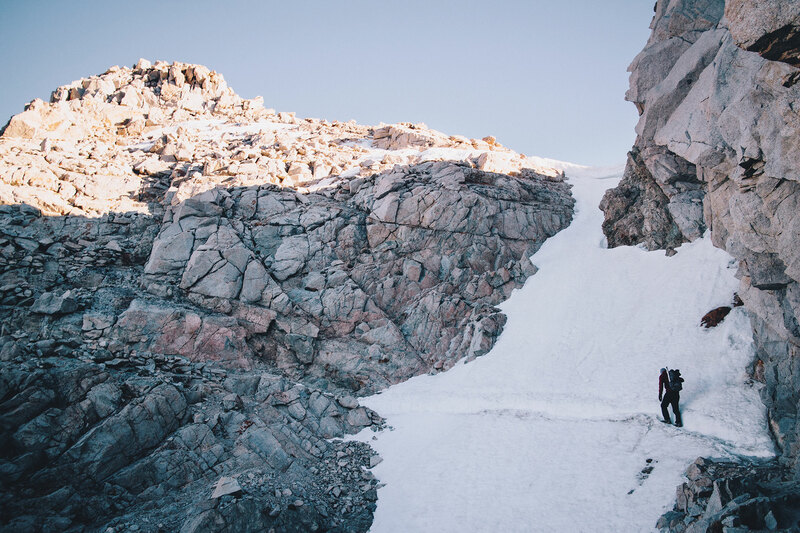 If you expect to be on the hiking in the Sierra or Cascades when there is snow on the ground, it is wise to go there the preceding year to see what it’s actually like. Reading about it or looking at photos is not the same as being there. Obtain in-person training. Take a class or learn from an experienced friend. 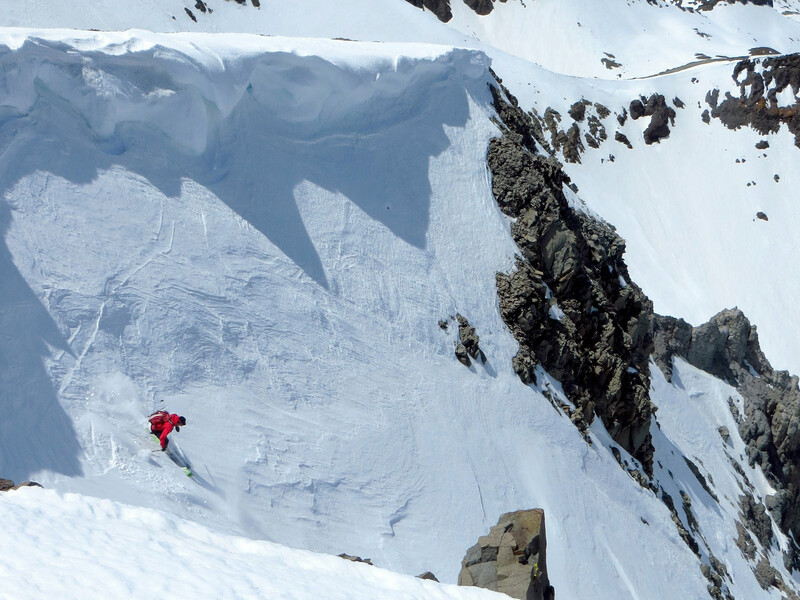 Snow travel is complex, skill intensive and risky. Don’t assume that other hikers will train you. They might lack skills, or you might find yourself alone and exposed. Always have options. Never put yourself in a situation where you have to do something dangerous. Having options lets you operate within your own personal levels of risk tolerance. By virtue of being in the mountains, some areas along the trail are well known for their avalanche danger. When snow is on the ground, specific snow travel and avalanche preparedness skills are critical. Take an avalanche preparedness class. PCTA.org interactive map; Turn on/off snow depth right on this website. NOHRSC interactive snow map: an outstanding map that includes historical snow information. PCTA.org trail conditions page; Look at the reports flagged ‘snow conditions’. California snow water content graphs; The three graphs are: North (Trinity through Feather and Truckee); Central (Yuba and Truckee through Merced and Walker) and South (San Joaquin though Kern and Owens). These regions are roughly equivalent to north of Lake Tahoe, Tahoe to Yosemite and Yosemite to Mt. Whitney. Historical snowpack maps; These maps show the percent of average totals for winter and spring months. Spring data is especially relevant to PCT travelers. 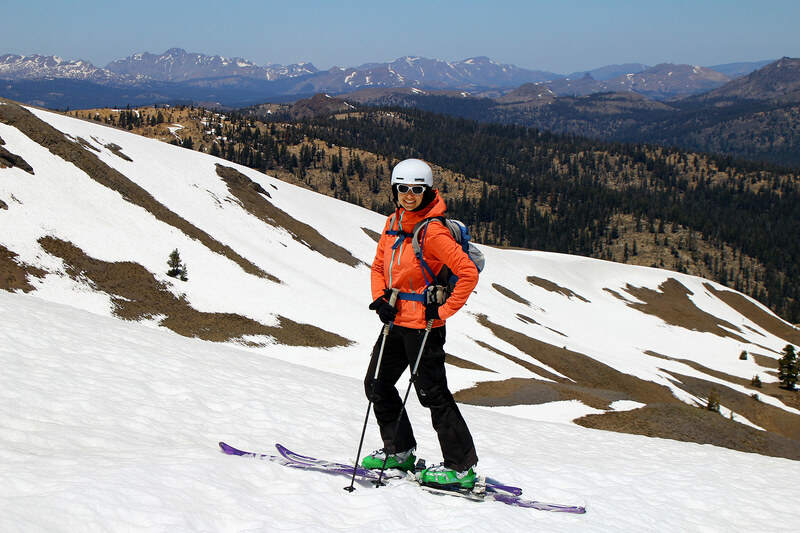 Backcountry ski forums; The Pacific Crest corridor is a playground for backcountry skiers. They are usually the most knowledgeable people about snow on the Pacific Crest Trail. Telemark Talk and Teton Gravity have active condition report threads for many regions along the trail. Look for threads with titles like “Sierra Ski & Snow Conditions”. They are usually the best source for photos of the current snowpack. We recommend weather.gov for forecasts. Use the interactive maps to click on the location that you want a forecast for. Be sure to read any weather warnings or alerts that appear. Many people will want to read the Forecast Discussion and Zone Area Forecasts that are found under the “Additional Forecasts and Information” header. A few places along the trail have snow-focused meteorologists who provide localized predictions for skiers and snowboarders. They generally stop forecasting in the spring.